For many years now, thrips have appeared in Anthurium crops and were often a serious problem. Today, good results are achieved in fighting thrips, particularly through the use of biological agents and natural predators. However, it remains a problem and growers are all too often surprised by the increase in thrips, and experience difficulties in effectively controlling their pressure. In every country in the world, Phalaenopsis thrips are increasingly common in the cultivation of Phalaenopsis. In this crop, there is also regular loss of yield because of damage caused by thrips. In both Anthurium and Phalaenopsis crops, there are also more and more different types of thrips. Each type of thrips has its own way of life and habitat and can cause a completely different type of damage. The degree of damage caused by each type of thrips is also different. In this article, we want to draw attention to the different types of thrips that occur. The aim is to get to know this enemy better and to be able to react quicker and more effectively. Often the controls used (biological) or carried out (chemical) have a much better effect if more knowledge about the thrips concerned is available. Damage to Phalaenopsis by Chaetanaphothrips. For effective control and to prevent increasing damage, it is important that the thrips are discovered quickly. Discovery starts with searching for the thrips: we call this scouting. This takes time and results in increased labour costs. Unfortunately, scouting during cultivation is an indispensable part of the growing process. To prevent or limit damage to the crop, scouting is necessary at least once a week. Scouting also builds up knowledge. It may be time-consuming initially, but with experience thrips damage can be recognized faster and often it is easy to see which type of thrips is involved. Thrips prefer certain types of flowers and plants (varieties). In the case of both Anthurium and Phalaenopsis, thrips are most common in species with white flowers. There are often specific species that turn out to be a host plant for thrips in the greenhouse. When scouting, this can also be a tool. First, check these 'sensitive species'. It is important to find out where the thrips come from. Try to find out which thrips problems neighbouring farms experience during the year (e.g. vegetable crops, other orchids, outdoor grain or corn crops, etc.). It is often the case that thrips pressure in the greenhouse increases when adjacent farms are harvesting or when there is a lot of aeration being done. Be extra-vigilant to prevent thrips when you know which types of thrips are commonly present in the crops of neighbouring farms. An increase in thrips in spring is often due to the overwintering of thrips pupae in the greenhouse (cultivation). This is why it is so important to monitor the crop well in the autumn. During these months, the thrips must be prevented from depositing their pupae in the substrate. This information is particularly important to choose the right measures when chemical intervention is required. Most thrips pupate in the substrate. But if the thrips pupate on the leaf (Thrips setosus), this may mean that introducing nematodes or predatory soil mites has less effect. The type of thrips occurring as a plague can often be recognized by the damage symptoms. In Phalaenopsis cultivation, orchid thrips can cause serious damage, while Californian thrips can cause more, but less devastating, damage. Silver spots on the leaf often indicate the presence of Echinothrips. A fairly unknown characteristic of the presence of thrips in Anthurium is the possibility of egg craters in the flowers. Several types of thrips leave their egg deposits in the leaves or flowers. When the eggs are deposited in the epidermis of the flowers (Anthurium), this is often seen in the form of egg craters that remain after the egg has hatched. Sometimes the egg craters are more visible than the actual damage to the leaves. In Phalaenopsis cultivation, apart from thrips damage there is also the chance of a virus spreading through thrips. The most common viruses are TSWV (tomato spotted wilt virus) and INSV (Impatiens necrotic spot virus). Biological control of thrips is not easy. Usually a combination of agents and measures is needed to control thrips biologically in an optimal way. There are quite a lot of organic products available against thrips. Agents that increase plant resilience. It is important to know the effect on biological enemies when using chemicals. Some agents have a long after-effect on natural enemies. The side effects lists of the different manufacturers and suppliers can provide good information in this respect. Most thrips have a relatively short life cycle that depends on temperature. At 20°C this is 23-27 days, at > 25°C only 6-8 days. 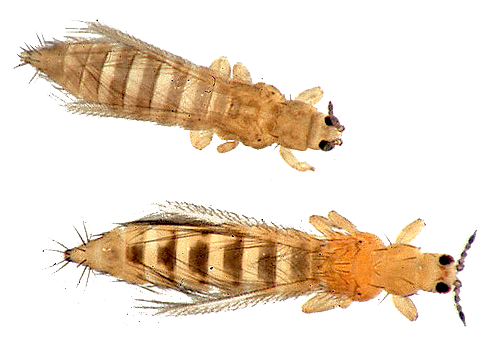 Although the life cycle of most thrips is shorter at higher temperatures, there are differences. It is good to know if spraying every six or eight days is necessary. 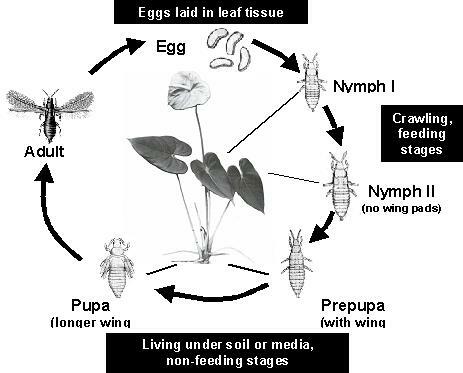 For adequate control, it is important to know the life cycle of the thrips that need to be controlled, so that this can be broken. In the case of a shorter life cycle, new generations are established quickly and there is the risk of resistance developing. The interval between control measures must be short enough to break the life cycle. In order to combat them properly, it is necessary to repeat a spray twice. After these repetitions, another agent should be used for the next control to prevent the risk of resistance. A second factor that is important when using chemicals is physically touching the insects. Because thrips are generally very light-shy, they hide in leaf axils and the substrate. To hit them well, it is necessary to spray with a lot of liquid and use the right quantities in the LVM or fog systems. Resistance development can only be combated by tackling the pest biologically or by carrying out precisely targeted chemical controls. This means that the chemical treatments are carried out in such a way that the pest insect (in this case the thrips) is targeted exactly. The timing of the sprays must be properly matched with the conditions under which they develop, and after two or three treatments the crop protection products should be alternated with a product that has a completely different mechanism of action. There is a global platform that oversees the classification of the active chemical ingredients in crop protection products. These active substances are classified into groups of different MOAs (Mode of Action, or mechanism of action). Each different MOA has a number. An active substance with a different number than the one used previously could be used as a suitable switching partner (provided there is sufficient impact on the insect to be controlled). This classification can be found on the website of the IRAC (Insecticide Resistance Action Committee). https://www.irac-online.org/modes-of-action/. There is also an app available from IRAC MOA. For more information you can contact Bureau IMAC Bleiswijk B.V.